Food Scoops helps a lot in keeping your dog’s food untouched by the hand thereby making it absolutely safe to consume. They are also non-toxic and does not trap bacteria thereby maintaining overall good food hygiene. 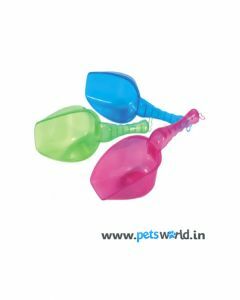 At PetsWorld, you will find translucent Pet Food Scoops in bright colours for easily scooping out any kind of dog food- be it solid or semi-solid. Food Scoops available at PetsWorld are easy to wash and consists of hanging slots in order to easily place on your walls. The ergonomic grip of the scoop also paves way for better handling. They are highly durable and completely dishwasher safe, thus making them easily cleanable. They are heat and cold resistant, thus keeping a steady temperature all the time. You can also portion control the food for dogs by feeding them in the scoops, thus keeping a check on their appetite. As a lot of pet owners do not bother about the portion of their pet dog’s food, it often leads to the problem of obesity.